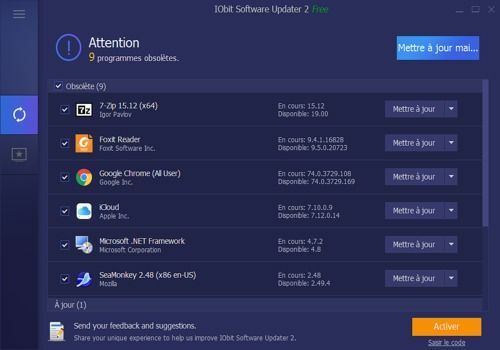 IObit Software Updater is a lightweight, advertising-free and totally free software that helps you update all obsolete software in one click and easily install all essential and popular software. With IObit Software Updater, you can save a lot of time and energy. The one-click update solution prevents you from updating obsolete programs one by one from different sources or websites. IObit Software Updater allows you to automatically update programs at the scheduled time and automatically shut down or restart your computer once the update is complete. In addition, IObit Software Updater provides an extensive software database for critical software in different categories: browsers, security, social networks, multimedia, runtime applications, utilities and tools. You can easily and quickly install all selected software with one click without worrying about annoying ads or bundleware, even malware. O&O Defrag 22 Professional Edition unleashes the performance of your PC and solves the performance and instability problems often caused by hard disk fragmentation. Ashampoo WinOptimizer is an optimization program developed by Ashampoo. It allows you to improve the performance of your computer by scanning your machine for areas for improvement. Heimdal Free is a software that monitors your programs to alert you when updates are available. The tool remains in the background and takes care of installing them if necessary. Avast Driver Updater is a utility that helps you update your drivers. It has a large database with more than 500,000 drivers to ensure that you find everything your PC needs. Optimize your system, remove unnecessary resources, and create a clean environment.